Join the discussion on our forums! Come discuss Cryostasis over in our dedicated Cryostasis discussion topic. Give a minion +3/+3 and Freeze it. We'll thaw you out when we find a cure! ragnaros rotated out for this. 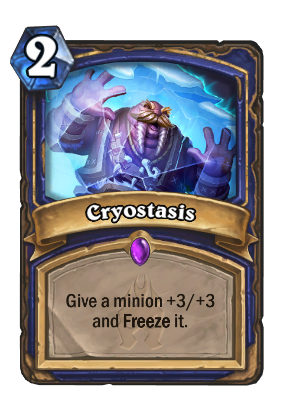 People seem to think that Cryostasis causes your card to be frozen past the turn you play the card. That is not the case. The minion targeted by this card unfreezes once your turn is over. The Freeze just prevents you from attacking with the buffed card this turn. Good luck dealing with that turn 2 5/6 mana wyrm. Also you might buff your apprentice when you expect a consecration, holy nova etc. Unfortunately, this is a Shaman card, not a Mage card. Oh, that makes it far worse. It sounds exactly like a mage card. Play this the same turn you played the minion you want to buff. Freeze effect won't matter because it can't attack yet anyways, and will be unfrozen next turn to attack. That's not how Freeze works. I just played the card. That is how Freeze works. Don't forget that you can cast this on your own Moorabi if this last one is already in play. So, you get a second Moorabi in your hand ! Moorabi's effect only happens when ANOTHER minion is frozen. Doesn't work on himself. Someone is gonna use this on their own guy and silence it to unfreeze it aren't they? Perfect card using it on a taunt!It can be so powerful in other minions too but in taunts it will be fantastic! Can't say exactly how effective it's going to be, but I'm definitely trying to make a taunt, cryostasis, moorabi deck. Imagine moorabi synergy with stonehill, white eyes, thing from below. Could at least be fun. Soo, freeze a taunt card like Voodoo Hexxer or the already very passive Tar Creeper, or pretty much any totem and you don't really feel like you are losing much by it not being able to attack and it becomes a much larger threat. With Moorabi you can generate more Voodoo Hexxers or maybe Stonehill Defenders. In a pinch you could freeze an enemy and use the new weapon for removal (or Doomsayer? or Poison minion?). Suddenly freeze is seeming pretty versatile. I'm betting any other freeze cards are going to come from neutral minions not class. I think they got enough here and they're going to have some neutrals that can be used for either mage or shaman. I'm kinda looking forward to trying freeze shaman. Freeze mage? not so much. I understand saying this is a slow card, and it is, but it demands your opponent either ignores it and pays, or is forced to waste a turn dealing with it, potentially wasting a hard removal on something as trivial as a 3/5 Wrath of Air Totem that now presents a considerable threat. Or one a' dem there pesky 3/6 Flametongue Totems. Tarnation, feller.